【Intelligent Truck&Car GPS Navigation】: It searches for the destination by the coordinate and transmits the data to PC via USB, provides intelligent route planning and an audible warning, indicates the speed limit and estimated time of arrival. 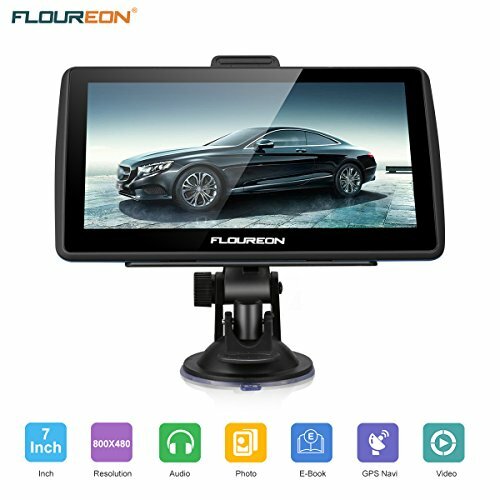 【FLOUREON 7 Inch GPS Navigation】: FLOUREON GPS Car with 7 inch LCD touch screen, the image resolution up to 800 * 480 pixels gives you a good picture view and a good user experience. The new version allows you to touch the screen directly by the finger. 【Lifetime Map Updates for Free】: Free map updates for free, if you need them, do not hesitate to contact us for a link to download, please. Support English, French, Turkish, Italian, Polish, Hungarian, Romana, Portuguese, Spanish. 【Multi-functional Vehicle GPS】: In addition to the navigation function, this GPS also has functions like video player (MP4), audio player (MP3), picture view, E-book, FM (ringing voice) etc.